April 5, 2017 April 5, 2017 Dr. R. A. Given the advancement in technology, it is easy to start a fire. However, there are key components that are required to keep that fire blazing, namely oxygen, fuel, and heat. If any of these elements are missing, then it will have an enormous impact on the intensity and even the existence of the flames. Sometimes at the beginning stage of a fire, the flames are most vehement, but as time rolls on, it begins to dwindle until it eventually goes out. The same scenario can be used to describe our passion for God and the things of the kingdom. As we continue along the pilgrim’s pathway, the flame that was once filled with zeal and passion begins to lose its intensity. This can be a result of many factors such as disappointments, sickness, broken heart, fear, etc. However, regardless of the circumstances that cause us to lose fervor, whenever it occurs we find ourselves in a perilous zone. 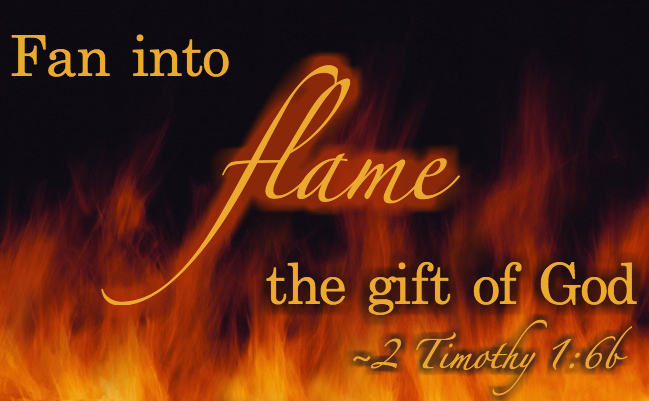 The Apostle Paul was aware that this could take place as such he admonished Timothy to “fan into flame the gift of God.” What was the gift that God had given to Timothy? Was it fear? Was it timidity? Was it defeat? Was it hatred? Was it lack of self-control? No!!! Paul continued to “for God has not given a spirit of fear, but of power, love, and a sound mind.” This simple means that if we find ourselves at any point being fearful, envious, malicious, hating, not having self-discipline, etc., then the spirit we are operating in is not of God. We were never made to live in fear, cowering in shame and defeat, overwhelmed by depression or oppression and trembling because of inadequacies. Instead, we were created to live in victory, consistently displaying His power, love and wise discretion. Therefore, we should fan the flames by thinking about things that are praiseworthy, lovely, admirable, right, pure, true, noble, honest and of good report. Additionally, read and meditate on the word of God, and pray about everything. Has your passion gone dim? Are you fearful of things? Do you have malice in your heart? This is a sign for you to draw closer to God and fan the flames of His gift. Prayer: Lord, please help us to be confident in Your Word so that we can be confident and victorious in every aspect of our lives. Realign our thoughts so that we can focus on the things that promote growth within us and make us better individuals. Empower us to draw closer to you so that our feet can be planted on higher ground. Wherever our flame of Your gift has gone out, I pray that You will rekindle. Show us the areas that have gone dim so that we can fan them into flames. Amen. January 3, 2017 January 3, 2017 Dr. R. A. It is human nature to build things as building represents growth and progress. However, when building there is a process that has to be adhered to in order for that which we are constructing to remain through the test of time. The most important step in the process I believe is laying a foundation. Laying a foundation requires much effort as one will need to get beyond the surface level and encounter dirt and grime which not everyone wants to confront. This process is crucial especially in building relationships. Relationships will not last unless its roots are anchored beneath the surface. Many of us like starting relationships but are not will to put in the effort that is required to maintain those relationships. Sadly, this type of behavior is transferred even in our relationship with God. In the Luke 6, the question was posed as to why do we keep calling Lord, Lord when we do not do what the Lord instructs. It proceeded to relate a parable of building a house one which had a foundation and done that did not. The one without foundation easily collapsed as the tides of life crashed upon it and was laid in ruins. The one which stood firm, however, had to follow a series of steps. The first step was to come – COME to God not leaving any part of ourselves behind. Bring ALL of our fears, dreams, hopes, insecurities, emotions, needs, etc., and lay them at His feet. Allow Him to examine all of the data presented and add, subtract, divide and multiply accordingly, like the master mathematician. Secondly, we are to LISTEN to His teachings – give ear to the instructions that are being given as it will lead you into clear paths. Paths that will cause you souls to be refreshed and your life to flourish. Listen to His teachings as His words are like the honeycomb – sweet to the soul and health to the bones. Thirdly, is to follow the teachings – FOLLOW His words as they are a lamp unto your feet and a light unto your path. His words will empower you to live above sin and to live a healthy and prosperous life. Follow His teachings even in adversity as He will come to your defense and supply all of your needs. To COME, LISTEN, and FOLLOW will enable you to STAND FIRM when the floodwaters rise and crash against your house.